We have a strong know-how in Original Design Manufacturing (ODM). Due to our comprehensive electronics design services offering we are able to provide our customers either a complete solution from specification to end-product, or we can take on a smaller piece of a project. We are accustomed to working with multi-located projects with many stakeholders. We emphasize first-class design and excellent, flexible customer service. Familiar industries for our design teams include industrial electronics, security, telecommunications and energy.Our expertise areas include power control devices and test devices. Our intelligent and customized power control solutions are mainly used in locations with challenging environmental conditions. Our solutions are used in over 2 million power control devices worldwide. 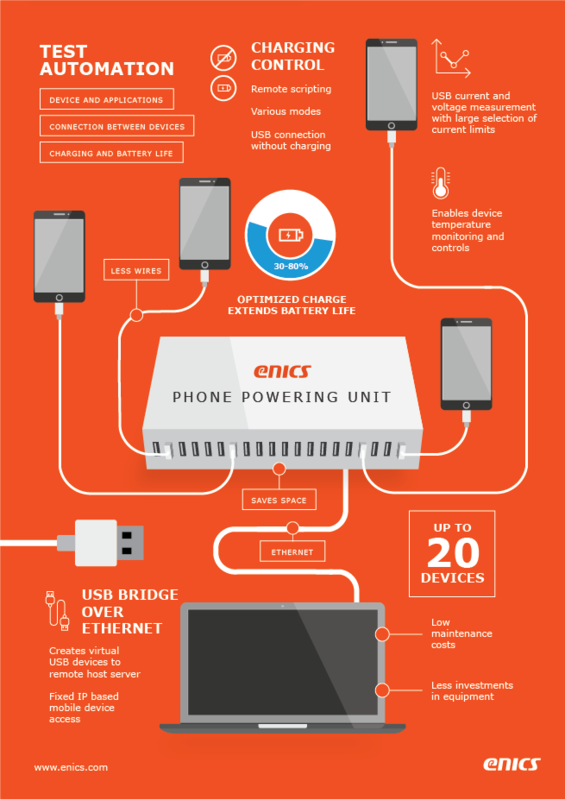 Enics’ product offering includes DC/DC, AC/DC, high voltage and precision power supplies along with surge protection devices. We are heavily focused on digital power development. Our design professionals are familiar with various safety and EMC compatibility standards. In our solutions high efficiency and heat control optimization are combined with compact size in order to ensure power control reliability with space-saving design. Thanks to our own testing facilities we are also able to perform EMC- and environmental testing in-house. In today's testing environments the equipment must face several challenges to ensure correct and failure free test results. Our power distribution units meet these challenges, and ensure safe and reliable power delivery. Our power distribution units can be used in various industrial applications. The improved PDU Power Breaker 48-16 is high current power distribution unit for 48VDC power supply line. It has 16 Ethernet controlled power channels and each channel is protected by a circuit breaker. The modules are hot swap modules, and each module can be customized according to customer needs. PDU Power Breaker 48-16 can be integrated into 19” rack units. A power distribution unit that distributes AC voltage to three separated output groups and has total 12 output connectors. Each output group includes EMI filters to minimize the electromagnetic interferences between the output groups. PDU EMI 16A can be integrated into 19" rack units. Our power supplies are mostly used in telecommunication and energy industries. Highly accurate, LAN controlled adjustable power supply with multiple isolated outputs which makes it ideal for product testing and calibration. LAN controlled power supply module with 4 independently adjustable outputs is ideal in PCB panel testing of battery powered electronic devices. Electrical surges from lightning storms, power disturbances and other exceptional circumstances often cause severe failures in electronic equipment if power lines are not adequately protected. Protection against these types of surges is highly recommended. Nactus is designed for power lines protection. It provides class II protection for both common and differential mode disturbances with optional power line distribution mode. Weakened protection level is indicated via an integrated warning signal feature. Nactus is equipped with a separate protection module which makes it easy to change without power interruptions. Digital power control means controlling the switch mode power supply with a high performance microcontroller. All control functions such as loop compensation, switch controls and protection functions are implemented in software which enables easy customization with minimal hardware modifications. Digitalization is the future of power control, and enables software-controlled functional integration and customization along with higher power control efficiency. Caiman is a fully digital 200W AC/DC platform for power supply. It is ideal for LED applications, but can also easily be customized for other environments. Caiman offers several benefits including easy customization, energy efficiency optimization and material cost reduction via functional integration. Furthermore, an advanced compensator algorithm guarantees an extremely low voltage deviation and short settling time in load change situations. We develop innovative test systems to every stage of the product lifecycle, and our test systems can be used for testing of various kinds of electronics products and also PCB assemblies. Our long experience in production testing of electronic devices is the basis for our offering. We have a track record of more than 2 million delivered test devices over the past 20 years. Enics offers two test product families, Enics Adapt and Chameleon, to meet the demands of our customers. Enics Adapt test platform family provides efficient solutions for PCBA level and End Of Line testing in volume production. With Enics Adapt test platforms it is possible to test both PCBA panels, individual modules and end products. Enics Adapt FT3000 series is a comprehensive test platform for PCBA level and End of Line testing in electronics production. It is designed to cover all the functional testing requirements of a modern electronics product. The Enics Adapt FT3000 series is CE compliant. All test features can be customized based on customer product requirements. Enics Adapt ST2000 series safety test platforms are test systems for high voltage, ground continuity and ground bond testing. They are designed to comply with the requirements of electrical safety test for most industrial electronics products in manufacturing environment. Burn-in testing is used to detect early failures in product before shipping. It is done by subjecting the product to high thermal, power supply and/or electronic load stress for an extended period of time. Most burn-in test solutions are custom designed as testing requirements vary highly from product to product. Enics can provide building blocks for burn-in test environment, whether the target is environmental/weather chamber, burn-in cabinet or burn-in room. These building blocks consist of test software platform, selection of proven test equipment and temperature-controlled chambers, and the framework for setting up product-specific parts on a relatively short lead-time. Contact our sales for more information. Enics Adapt Gecko RF19” is a highly efficient test platform with RF shielding for PCBA level testing in volume production. It provides double-sided board test option and easy controlling via Ethernet. Enics Adapt DualChamber is an ideal RF shielded test platform for advanced PCBA testing that includes two separate RF shielded fixtures. Test features include PCBA functional and RF testing. Testing complex devices proposes many challenges - it is often performed in several testing phases requiring extensive amount of test equipment and instruments. Test process is complex and time-consuming, and product change-over in many cases requires a totally new set-up from scratch. Chameleon products introduce a fully modular solution for End Of Line testing, and building a test environment is straightforward. You select a suitable platform for Your testing needs, and continue with selecting the needed test instruments. Chameleon products are suitable for EOL testing of e.g. wearables, infotainment devices, mobile phones and tablet computers. Chameleons perform RF testing, advanced audio testing, PCB panel testing, touch screen testing, display testing and final product testing. By choosing Chameleon You receive extensive testing possibilities in one package. Modular construction enables selecting only the test instruments that are needed for Your product, which ensures flexibility. Furthermore, all test instruments can be integrated inside the compact sized platform. The customized product specific module is the interface between device under test (DUT) and Chameleon. Exceptionally flexible construction makes Chameleon ideal for covering multiple test phases and products with the same test platform just by changing the product specific module. Chameleon 64™ is an agile and efficient test platform for basic testing of electronic devices. It is equipped with a programmable robot and a highly accurate camera system which makes it ideal for various testing needs. Chameleon 111™ is an RF shielded test platform for advanced testing of electronic devices. It is equipped with acoustic absorption, programmable robot or pneumatic upper adapter, and a highly accurate camera system. Chameleon 157 is a high-end test platform for extremely accurate audio and display testing of electronic devices such as mobile phones and tablet computers. It is equipped with extensive acoustic absorption, an integrated audio analyzer and a highly accurate camera system with analysis tools. Chameleon 257 is an RF and audio shielded test platform for comprehensive testing of electronic devices up to 15” size. Test coverage includes e.g. display, camera, audio, RF and sensors. Chameleon 257 is ideal for final product testing of mobile phones, tablets and vehicle infotainment devices. Enics Raahe's test instruments are integrated within the chosen test platforms which reduces the need for external cabling and saves space. If needed, all instruments can be used a stand-alone units also. With built-in analysis functions the raw data of audio tests is analyzed within EAA 4-2-1 which reduces the external computer system load. 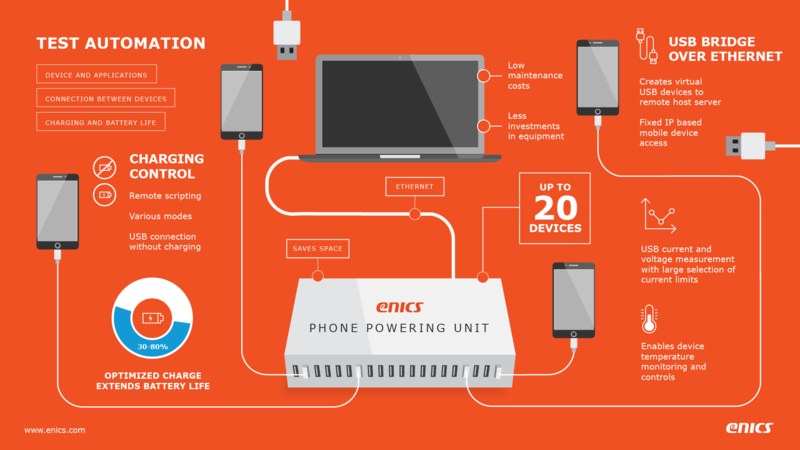 Enics has co-operation partners in testing. In order to provide the best test systems to our customers, we have created a network with the top players of test and measurement technology. Together with our partners we can provide more larger test systems and equipment more efficiently. NOFFZ Technologies is an owner-managed technology company with core competencies in the design, development and manufacture of customer-specific test solutions. NOFFZ creates test systems and solutions in the area of the Internet of Things (IoT) - especially in automotive RF-Test applications around eCall, Network Access Devices (NADs), Telematics Control Units (TCUs) and Infotainment/Multimedia Units. Based on the Universal Tester Platform (UTP), NOFFZ delivers customer-specific test systems worldwide for the entire product creation process. Application areas range from simulators and hardware-in-the-loop (HIL) in development via validation with continuous operation and run-in test stands to manufacturing with ICT, FCT as well as vision, haptic and screening systems – both offline and inline. We distinguish ourselves through a very broad range of services, which allows us to solve complex challenges smartly and efficiently. We offer many years of know-how, not only in the innovative tester solutions area, but are also specialists for RF & wireless solutions as well as process and automation technology. NOFFZ Technologies is a general contractor from compact stand-alone solutions to sophisticated complete systems and also one of the biggest NI Wireless Test System (NI WTS) Partner for worldwide RF Multi-DUT Test Solution.